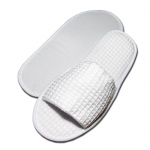 Six pairs of our - one size fits most - closed toe puffy waffle Spa slippers for men. These slippers are Perfect for after shower, bath, spa, or just lounging around! 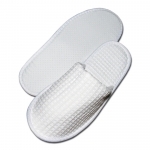 Six pairs of our - one size fits most - open toed puffy waffle Spa slippers for women. These slippers are Perfect for after shower, bath, spa, or just lounging around! Three pairs of our made in the USA paraffin boots with a plush terry velour outside and lined with thinsulate to keep your feet nice and warm. 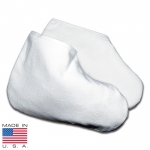 Three pairs of our made in the USA paraffin mitts. 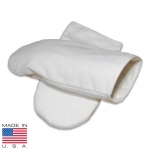 These mitts have a plush terry velour outside and are lined with thinsulate to keep your hands nice and warm. Three light - medium weight - waffle weave robes provide your guests with a touch of luxury.